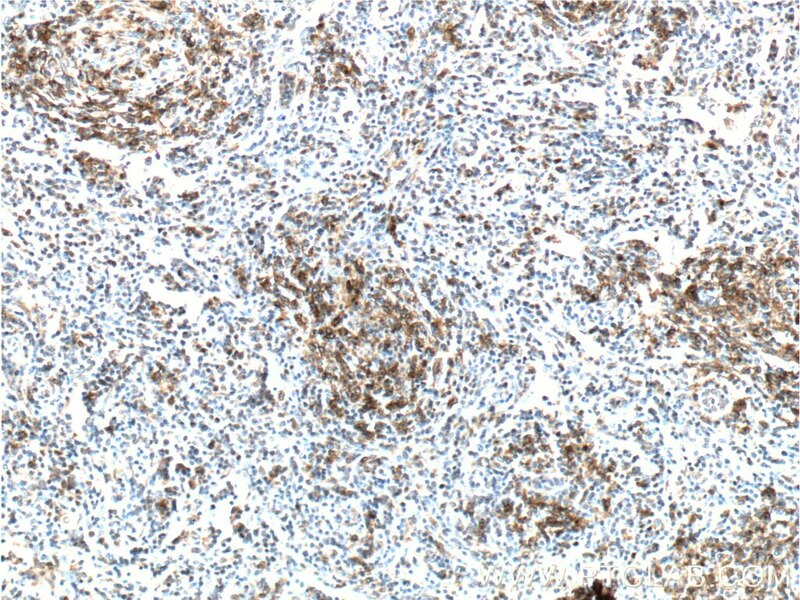 Immunohistochemical analysis of paraffin-embedded human tonsillitis tissue slide using 66220-1-Ig (PD-1/CD279 antibody) at dilution of 1:2000 (under 10x lens) heat mediated antigen retrieved with Tris-EDTA buffer(pH9). 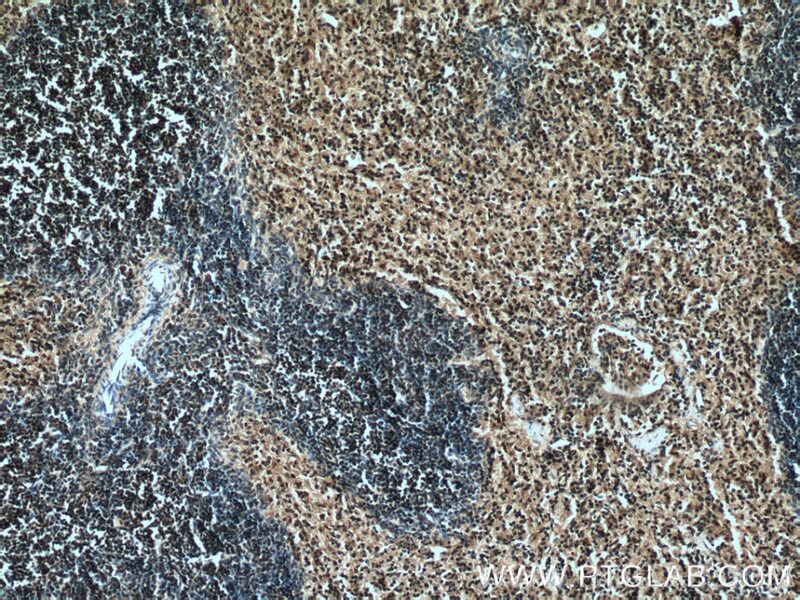 Immunohistochemical analysis of paraffin-embedded human tonsillitis tissue slide using 66220-1-Ig (PD-1/CD279 antibody) at dilution of 1:2000 (under 40x lens) heat mediated antigen retrieved with Tris-EDTA buffer(pH9). 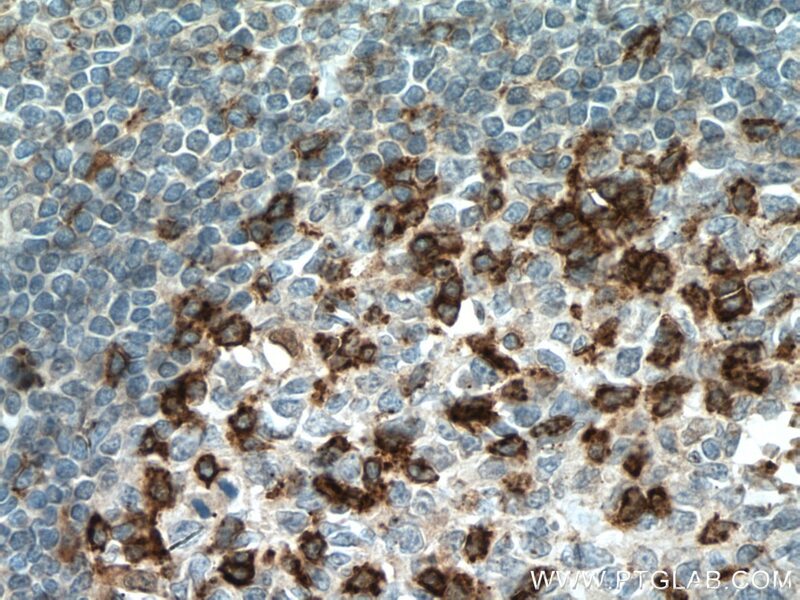 Programmed cell death 1 (PD-1, also known as CD279) is an immunoinhibitory receptor that belongs to the CD28/CTLA-4 subfamily of the Ig superfamily. It is a 288 amino acid (aa) type I transmembrane protein composed of one Ig superfamily domain, a stalk, a transmembrane domain, and an intracellular domain containing an immunoreceptor tyrosine-based inhibitory motif (ITIM) as well as an immunoreceptor tyrosine-based switch motif (ITSM) (PMID: 18173375). 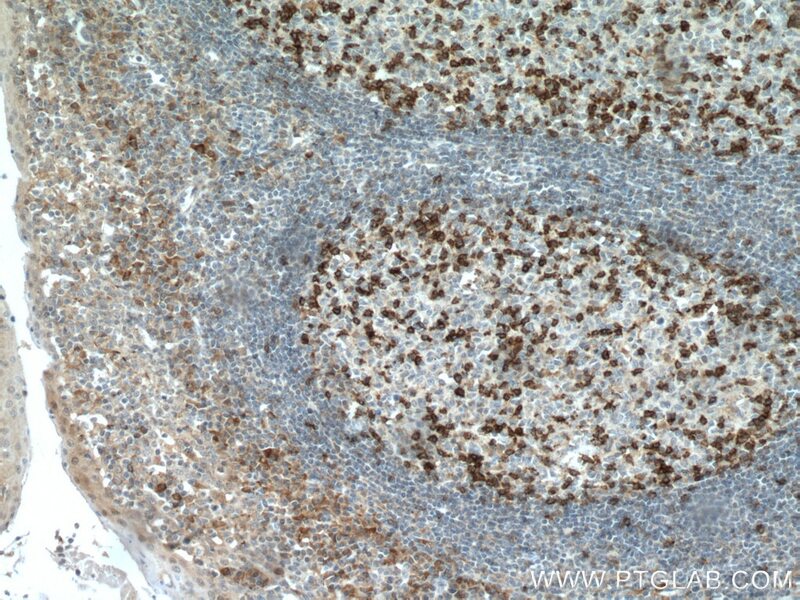 PD-1 is expressed during thymic development and is induced in a variety of hematopoietic cells in the periphery by antigen receptor signaling and cytokines (PMID: 20636820). 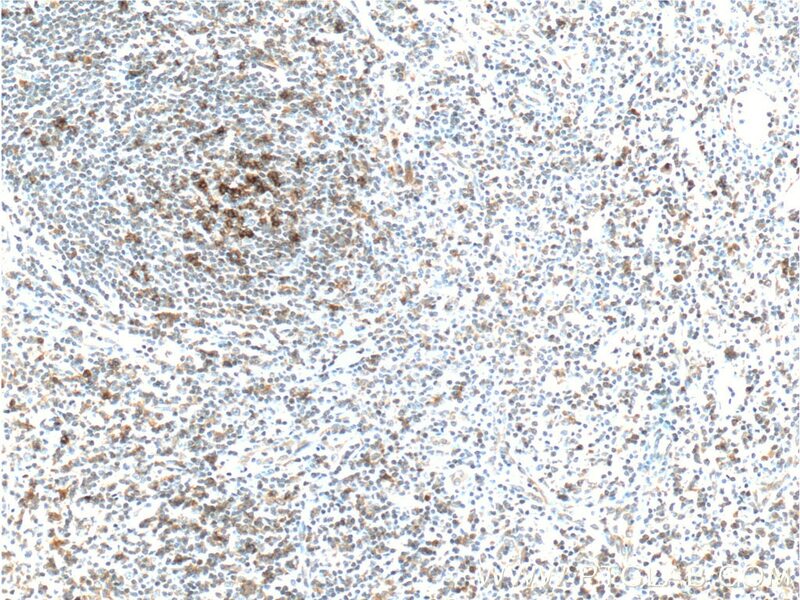 Engagement of PD-1 by its ligands PD-L1 or PD-L2 transduces a signal that inhibits T-cell proliferation, cytokine production, and cytolytic function (PMID: 19426218). 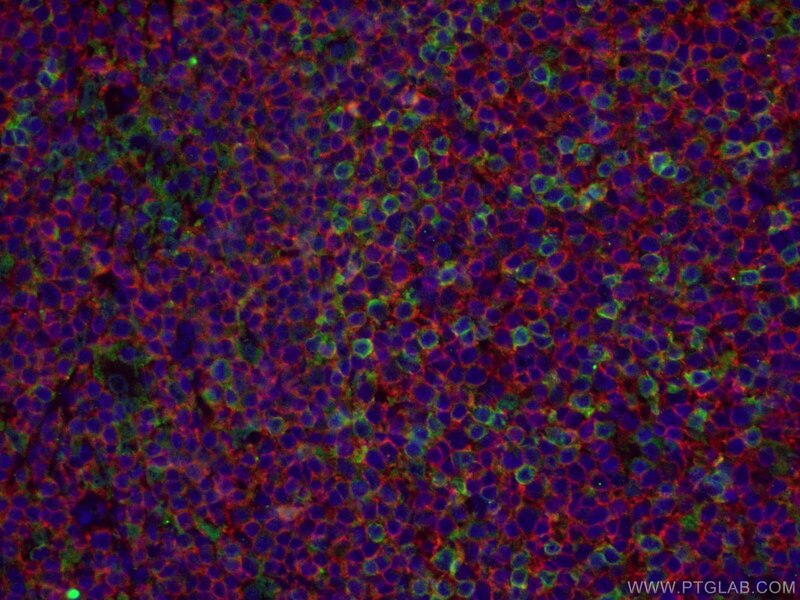 It is critical for the regulation of T cell function during immunity and tolerance. 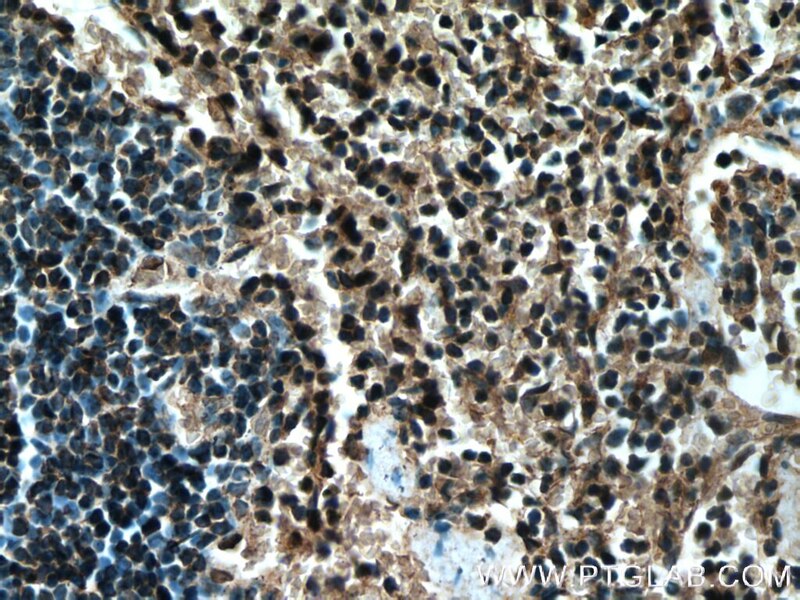 Blockade of PD-1 can overcome immune resistance and also has been shown to have antitumor activity (PMID: 22658127; 23169436). 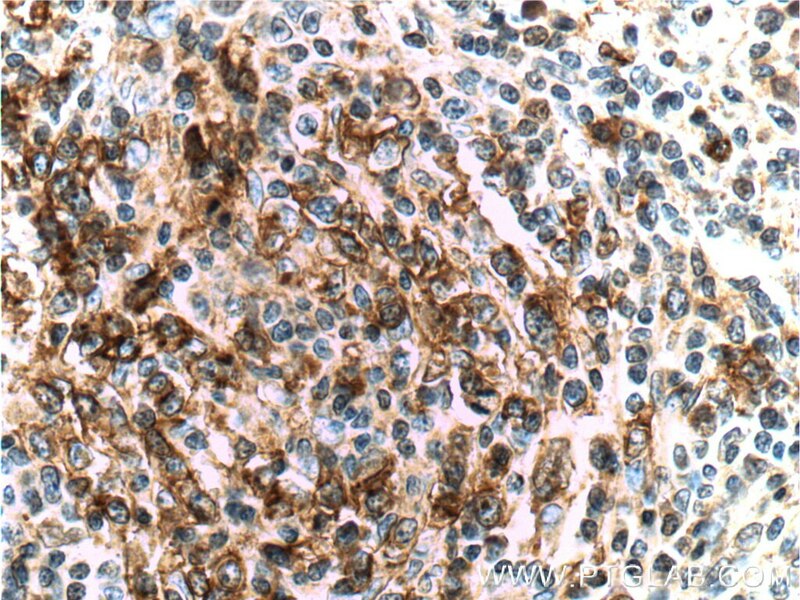 The calculated molecular weight of PD-1 is 32 kDa. 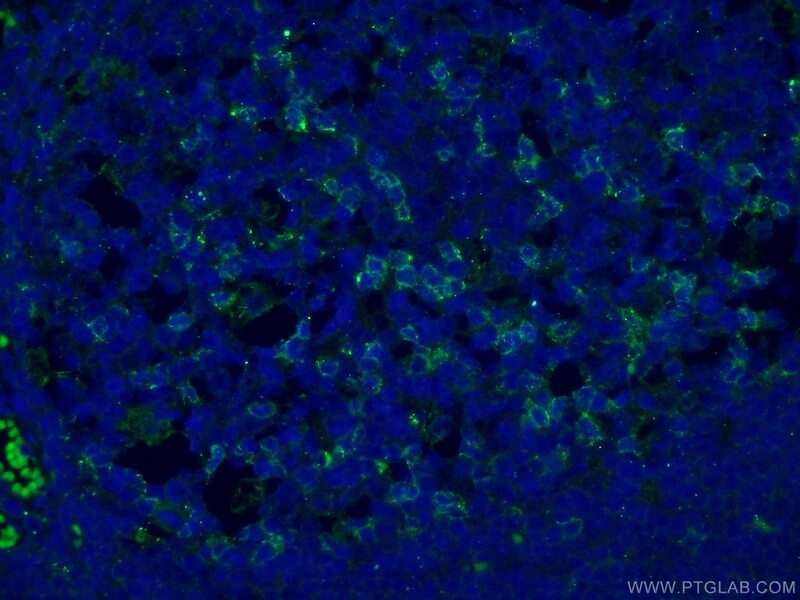 It has been reported that PD-1 is heavily glycosylated and migrates with an apparent molecular mass of 47-55 kDa on SDS-PAGE (PMID: 8671665; 17640856; 17003438). 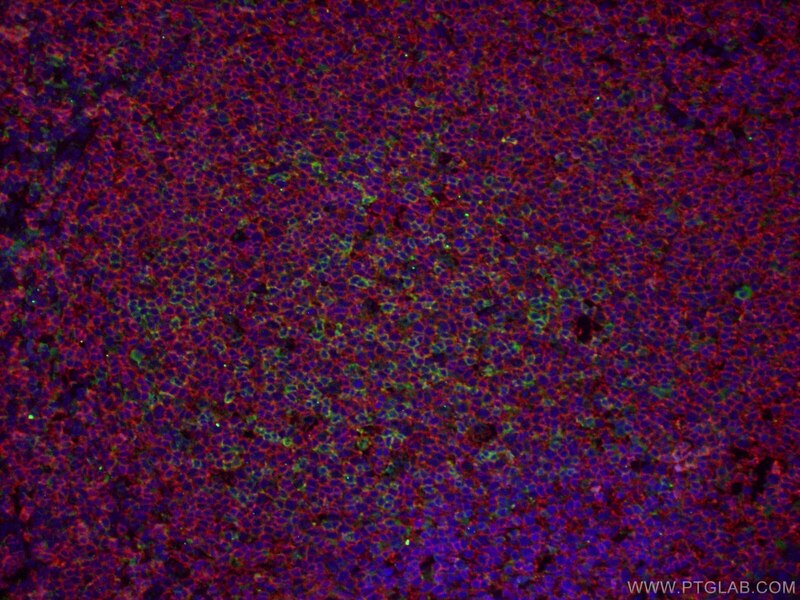 Immunohistochemical analysis of paraffin-embedded mouse spleen tissue slide using 66220-1-Ig( PD-1/CD279 antibody) at dilution of 1:200 (under 10x lens) heat mediated antigen retrieved with Tris-EDTA buffer(pH9). 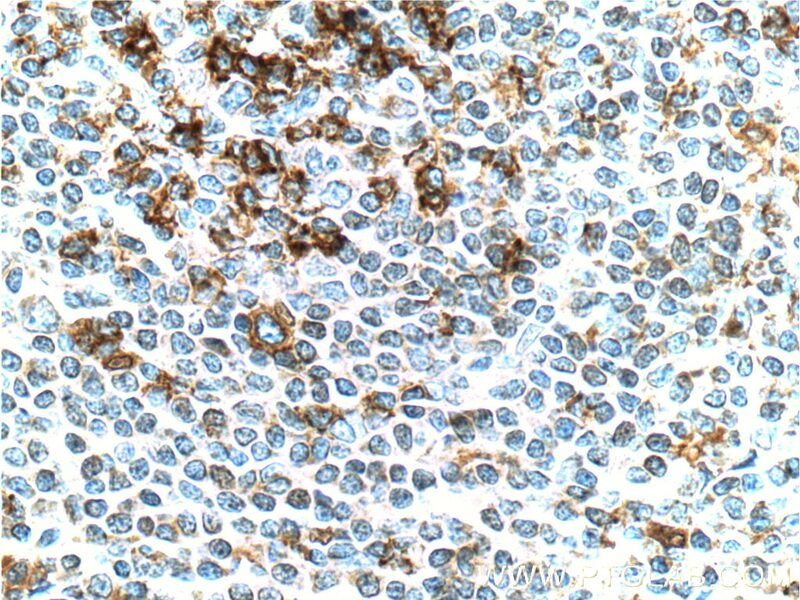 Immunohistochemical analysis of paraffin-embedded mouse spleen tissue slide using 66220-1-Ig( PD-1/CD279 antibody) at dilution of 1:200 (under 40x lens) heat mediated antigen retrieved with Tris-EDTA buffer(pH9).